When Should you Have Your Mattresses Cleaned? Cleaning a mattress (that is used daily) at least once a year is a great way to keep it in the best possible condition. Accidents such as spills, stains, odors, water damage may require immediate attention. 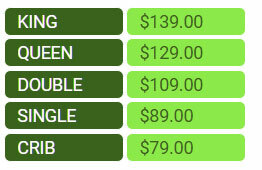 We’re here to make the process quick, easy and affordable. It’s surprising to know that many people aren’t aware that a mattress can be professionally cleaned. Mattress fabrics, as with most other fabrics, soil over time absorbing items from the surrounding environment along with a steady buildup of your biological ‘left overs’ such as dead skin. Since most people spend about 1/3 of their life on a mattress, an annual cleaning is a very practical investment. Your mattress can be completely cleaned and sanitized in less time it takes to wash and dry a load of laundry. extend the usable life of your mattress. A proper mattress cleaning must penetrate as deep as the stain and then be flushed and extracted out of your mattress properly to avoid mold, mildew and build-up. 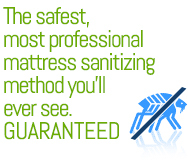 Our Mattress Cleaning process will do the heavy lifting for you and have your mattress totally clean and sanitized. Can a mattress really be cleaned? 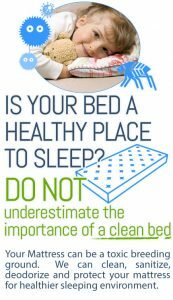 Yes… any mattress that is used on a regular basis can and should be cleaned to eliminate and prevent buildup of contaminants including dead skin, allergens, stains, odors, etc. For mattresses getting normal use, we recommend cleaning at least once a year. However, if you have pets sleeping with you or if you have allergies or asthma we recommend every 6 months to maintain a significantly lower level of irritants in your mattress. In the event of accidents causing potential stains or odors we recommend a professional mattress cleaning as soon as possible. Are toxic or dangerous chemicals used in your cleaning process? Absolutely not! We use a mineral based non-toxic, allergy and asthma safe, soap-free anti-microbial cleaning solution that is EPA certified and meets all green certification standards. How exactly will you clean my mattress(s)? We utilize a 3-step mattress cleaning process: Step 1 – we thoroughly vacuum every surface of the mattress – top, sides and bottom. Step 2 – we apply a dry-foam anti-microbial cleaner and agitate by hand with natural sponges. Step 3 – we rinse with 210 degree water utilizing a special low-moisture upholstery cleaning system. How long will it take my mattress to dry? Because we use a low-moisture cleaning system, under normal conditions, it shouldn’t take more than 2 hours for your mattress to be completely dry and ready to apply linens. Can you remove the stains on my mattress? We pretreat all spots and stains and most will be completely gone or significantly reduced. Probably. There are mites in over 95% of mattresses and many with high enough concentrations to cause allergic reactions in people who never exhibited any previous allergic tendencies. Should I really replace my mattress after 7 years? This is what the mattress industry would like for you to believe. However, if you aren’t experiencing sleep discomfort due to mattress structural issues we can save you a lot of money by cleaning and sanitizing your existing mattress. This will freshen your mattress by removing the buildup of dead skin, bacteria and odors and allow extended use of your mattress.